My first Ladies Room Fashion Show was a smash hit and I’m super excited for this week’s edition. I even found a verse in Proverbs 31 that corresponds with fashion. 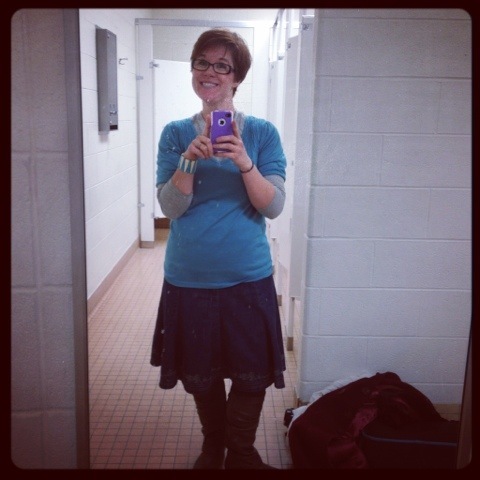 I love being able to dress modestly, frugally and (maybe just a little) fashionably. 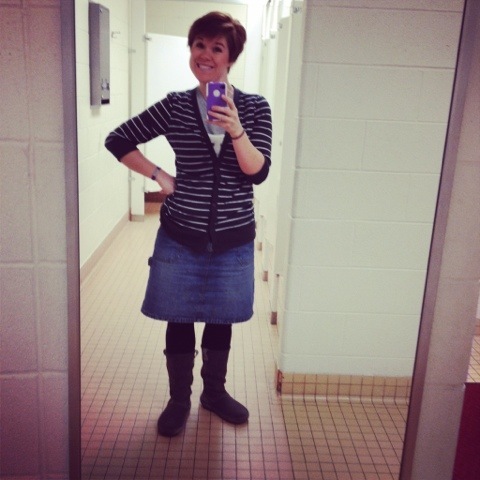 Skirt: New York & Company–BEFORE KIDS, folks! And it zips. Easily. Do the work, people. It’s worth it. Slip: No idea. Wear a slip girls–especially when wearing cotton on cotton. Obviously, I love this outfit. I wore it to my friend Lisa’s baby shower Saturday. 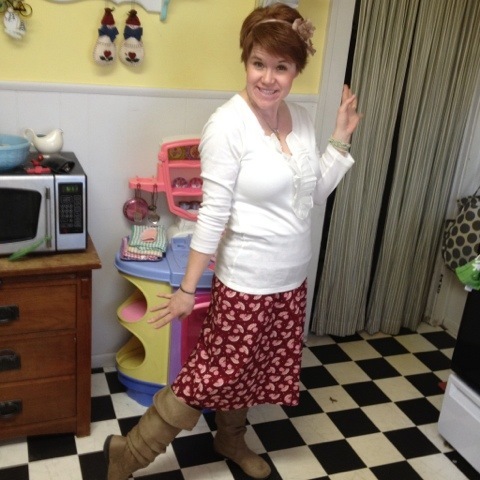 I love soft brown of the suede boots and the color of the flower in my awesome red hair. I’m also loving being a red head this season! If you look close, you’ll notice a bracelet I made by wrapping a long beaded necklace around my wrist. This is especially cool because they’re vintage beads that belonged to my Mimi. Loved this outfit, too. I got a lot of compliments at church which is always good for the old self esteem. 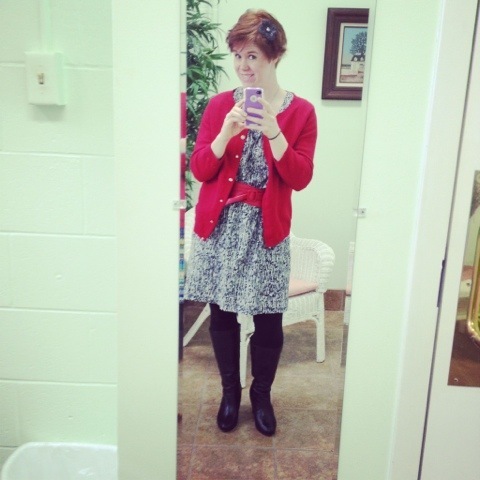 Also, isn’t our church bathroom cute?? I don’t love how dark this picture is. You can’t see the cute detailing on the bottom of the skirt. And those are the same light suede boots from two pics up–yeah. It’s too dark. This outfit was cute, but the cotton-on-cotton shirts kept sticking together in weird ways and bunching up. I felt like I had to keep pulling them down all day and I didn’t love that. My guess is you won’t be seeing this combo again. I love this shirt with the bracelet, though. Matt pick out good stuff :). Some mornings I wake up and think “I should wear pants. I don’t have to wear skirts/dresses every day. Lots of people wear pants. I can handle pants. I look good in pants.” BLEEEEEEAAAA. Seriously, look at the leg on that pant. It’s ginormous. It makes me look bigger than I am. Not cool, folks. Not cool. This look just screams “classic teacher” to me. And not in that good way. Hair Clip: I made it! 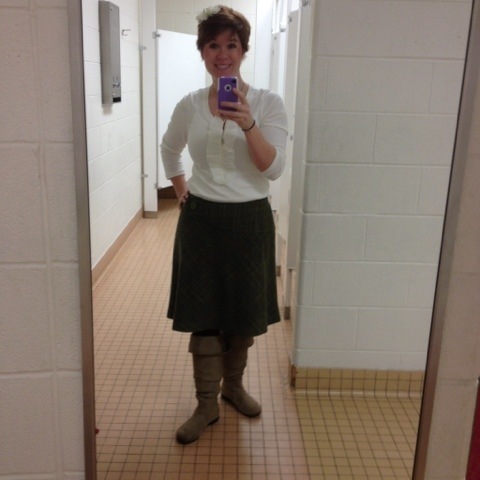 Trying to recapture some of the magic from Saturday’s outfit, I paired this top with an old tweed skirt and I love it. The photo’s too dark to see the cool lime greens and pinks running through this skirt, but trust me when I say that this outfit was fantastic in person. I would have never thought that I could tuck in my shirt, but I think it looks okay. This skirt was screaming for a tucked in shirt. 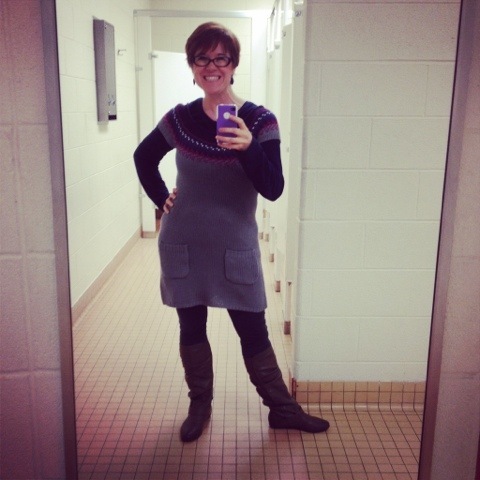 Remember last week when I said I wanted to wear a dress but couldn’t find the right leggings? This is it. I picked up this little gem at Plato’s Closet when Matt & I were there trying to find him pants for his Christmas Eve Service–which we totally did because Plato’s Closet is AWESOME–and I ran across this dress. For six dollars. Seriously. Why do people pay more than $6 for clothes??? I’ll never understand it. You can tell from the picture that I’m super excited to be wearing this dress. Mostly because it’s new, but also because it looks so tiny on the hanger. Truth be told, I’d love to see what it looks like just one size bigger on me, but that’s the only problem with resale. None the less, I’m trying to tone up, so I think this dress totally works now and only has the potential to look better in the future! I draw fashion ideas from a lot of places–those blogs I mentioned yesterday, friends, magazines, people I see, ads, TV, movies….the list goes on & on. But this one? This idea?? I totally stole this look from a 3rd grader. Boots are big this year in 3rd grade (and their little feet look darn cute in ’em) and I have a little girl who wears stuff just like this all the time. I adapted it a little for a grown-up look. At least I hope it’s grow-up!! Also important for this look was WARMTH. It’s 17 degrees here today, so these boots were a must. And I think cotton leggings, knee high boots and a skirt are warmer than pants any day of the week. 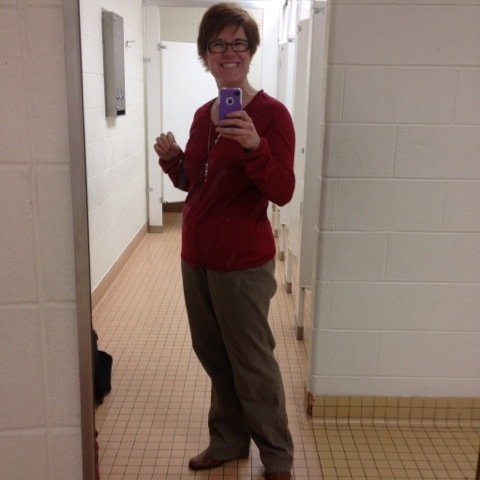 Thanks for reading this week’s Ladies Room Fashion Show!! Tune in next week for round three!! Love the cardigan! Also loove the fact you got it at Platos closet! It is a great place! I may be a tiny bit biased but I do get almost everything from there!